A super easy dollar bill heart makes a fun gift. Sometimes money is the best gift to give, but it seems so much nicer when you wrap it in a fun way or do something special with it. 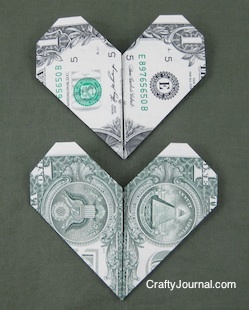 This is the third dollar bill heart tutorial I’ve done, and it’s very easy to make. Dollar bill heart origami is here. And easy dollar bill heart is here. I found this tutorial here and have enjoyed making the hearts. You can use any denomination of money for it, too. How to Fold a Super Easy Dollar Bill Heart. 1. Fold the bottom edge of the dollar bill to the back side about 1/4 inch, or at the top of the words “one dollar”. Crease sharply. 2. Fold it in half from side to side, matching all edges. Crease sharply. 3. With the back side facing you, fold the bottom edge of one half of the dollar to the center fold line. Crease sharply. 4. Fold the other side the same way. Crease. 5. Turn the bill over so George is facing you. Fold the center corner of one side down to meet the edge. Crease. Repeat with the other center corner. Crease. 6. Fold each outer corner in to meet the edge. Crease. 7. Fold in a small part of each corner that sticks out on the sides. Crease sharply. Turn it over to see the super easy dollar bill heart. And here’s how the dollar bill heart looks if you fold it with the back side on the outside. Give a super easy dollar bill heart for Graduation, Mother’s Day, a birthday, or use as party favors. It would make a fun stocking stuffer, too. For best results use a nice crisp bill. Creasing sharply is what makes the finished piece look really good. Oh I love this!! So perfect for the Dad, grad and wedding gift giving season almost upon us. Saw this at Make the Scene Monday. Thank you so much for sharing and have a fabulous week. What a unique idea for gifts for graduation. Thanks for sharing. I use to work in a bank and we use to do a lot of money oragami – I don’t remember doing hearts though – very cute! Thank you for sharing on Fluster’s Creative Muster Party! Great tutorial! My husband made me a dollar bill ring when we were still dating… Love the things you can do with origami… Thanks! Hope you have a great week!! I’m thinking this would be a great gift for kids to make on mothers day! Thank you for sharing! Perfect for sending money to my college student :). Visiting from Frugal Friday! Blessings! I’ve always wanted to know how to do this. I’m saving this. This is a great gift for the grandkids. Another great idea we featured last year for mothers day. I am so pinning this right now! This would be a great way to gift money. Thanks so much. Thank you so much for sharing @ Inspire Me Fridays! Nice for a gift, too, don’t you think? Best wishes, Noreen. What a party last week on Friday Flash Blog! Thanks for joining us. I hope you’ve visited some of the other community members and you’re having a splendid week. Hey there! Thanks so much for visiting our blog! Have a great week! Such a great idea. Just pinned! This one is so much easier than the one I have been trying to make for hours now. Thanks so much. love love this! My kids will be happy I stumbled upon this when they recieve heart dollars for Valentines 🙂 Checking this out from In and Out Kitchen Link Party! Thanks for the great idea! I’m going to send these to my niece and nephews in their valentine cards. I think the only way Moms are going to get one is to hope THEIR Mom gives them one. Or show it to DH and tell him how much fun it is to fold $100 dollar bills! That will make me a popular grandma on Valentine’s Day! Thanks! Very creative idea. We have a shirt made from dollar bills that we have for years. I think it took 5 $1 to make. Thanks for sharing. I just might try this. Have a wonderful healthy day! Very clever! And a perfect gift for my godchildren. I did this last year and sent to my Grandson in a card for Valentine’s Day! It was fun and easy. Thanks for linking your instructions to TTF! My little man would love this he loves making paper airplanes and now he’s going to be making hearts! My kids will flip for this! I love it. Thanks for sharing. Hello! I saw your linky on Think Pink Sundays at the Flamingo Toes blog, and thought I’d stop by to say hi! LOVE your blog! I’ve always wanted to learn how to do that! As the kids keep getting older money seems to be the best gift, I agree, making it cute/fun makes it more fun to give. This is awesome, thanks for sharing at our party! love oragami…this is a cute idea for valentine’s day. not too tricky either! What a cute idea! I love it for Valentine’s Day. Thanks for sharing at Family Fun Friday. I’m featuring you at this week’s party! I’ve seen these before but never knew how to make them; thanks for the simple tutorial! Pinning, and I featured this today on my blog! This is so cute, I have to see if I can do it myself! Thanks for sharing! I would love to have you hop over and share it. How cute! What a nice little gift to stick in a card. Thanks for sharing it with us on Snickerdoodle Sunday! Thanks for posting this! It looks easy enough that even I could make! I want to do 41 hearts and then string them together to make a lei. A gift for my sister.. her birthday is coming up. .. I have lots of time to do it. That sounds like fun! Everyone would love to receive a lei full of money. You could alternate the dollar bills with messages, or thoughts, or even memories. This is a different way to fold a paper heart. Nice to know! Great idea, I forgot about heart bills! My kids would be happy with one of these 🙂 Pinning! Thank you so much for posting this tutorial. I always put a few dollars in the grandchildren’s Valentine cards and it will be fun to fold them into hearts first. I love to do origami so will absolutely enjoy this. Thanks again; new reader but now I’ll be following your blog! This is cool! I hope I get one of these for Valentine’s Day, but with a couple extra zeros!! Thanks for the tutorial! Pinning! My kids would love seeing these on the table for breakfast on the 14th! What a fun idea to tuck into your teenager or college student’s Valentine. Love it. 🙂 Please come share your blog posts over at the Home Matters Linky Party! We’d love to have you for a visit. Oh, that’s so cute!!! Thanks so much for joining us at the #HomeMattersParty – we hope to see you again next week! So cute! I’m making these for my granddaughter for Valentine’s Day. Thanks for sharing. Featuring this one too at my Valentine’s Day round up Noreen. (Our lowest note in Australia is a $5 bill so I’m not sure I’ll be making too many of these. LOL) Great idea! This is such a cute idea! I often give my grands a little money for holidays. Pinning. Thanks for sharing with SYC. You’re right! Sometimes it is easier just to gift money. This is a brilliant Valentine gift idea. Pinned for later. I would love if you shared this at my 14 Days of Valentine Craft Link Up. What a great tutorial!! Thanks for sharing on My 2 Favorite Things on Thursday! Hope you come back and share some more!! Pinned! WOW! What a great tutorial! I used a worn $5 bill and created a great-looking heart on my FIRST try! Being spacially-challenged, this is quite an accomplishment. Thank you. I enclosed it with a Valentine’s Day card to my grand-nephew.